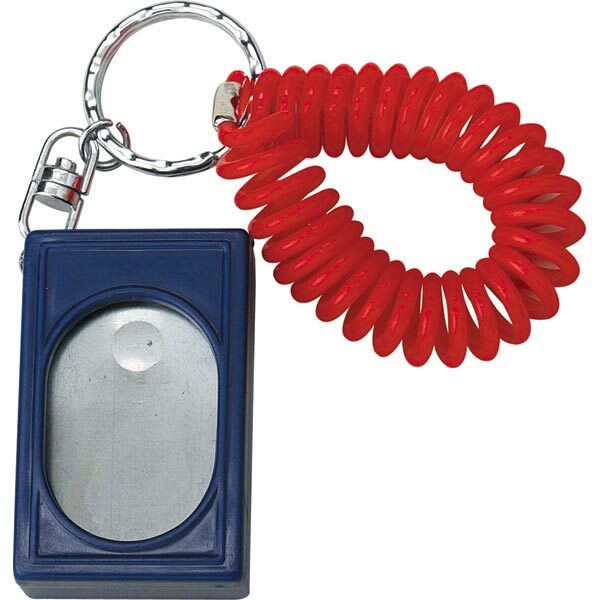 A clicker is a small plastic box with a lip, when pressed this lip creates a click sound. There are variations that emit different sounds or change pitch however i like the bog standard box clickers. The click sound is paired with a reinforcer that could be either a food reward, or a game such as tuggy or fetch. In English that means when your dog hears the click sound he knows he did something great and a really good reward is coming his way. Its basically a more consistent way to say good dog. No. The dog doesnt instantly know what the click sound means so you must charge the clicker adequately before you start. What can you do with clicker training? Anything! The difference between clicker training and traditional methods is that you can theoretically teach an animal to do pretty much anything. Have you ever thought how they get animals to perfom in the movies, somehow i dont think they wrap a choke chain around a whale and drag him through a hoop. Who can you clicker train? Anyone. Young animals are perfect for clicker training as they soak up everything about their environment. Older animals can also learn clicker training, but some take longer to catch on than others. You can even clicker train fish!!! Grab yourself a box clicker from your nearest pet shop and a bag full of really small (pea sized are ideal) but tasty treats. Use something your dog doesnt usually get like hot dogs or cheese, stay away from mass produced pet shop treats, they arent yummy enough. Make sure your dog is happy to be working and pick a quiet spot. 1) Click the box and give him a treat. 2) Click the box again and give him another treat. 3) Click the box again and give him another treat. 4) Yep you guessed it... you need to repeat this about 20-40 times. 5) Walk away and give him time to take in what hes just learnt. I like to check that the dog knows what the clicker means so when hes not paying direct attention (not when hes busy smelling or sleeping etc) i click the clicker and if he looks up then bingo you can start on the next step. When teaching a dog (or cat, rat, bird etc) that is new to clicker training i like to pick a really simple trick that he doesnt yet know. My favourite is the hand touch, rub something smelly on your hand and allow your dog to sniff it. As his nose touches your hand CLICK & TREAT (C/T). Repeat. Make sure your timing is spot on, you dont want to be clicking him for licking your hand or thats what he will think you want. Repeat lots. Once he is happily touching your hand as soon as you put it out to him you can stop rubbing smelly stuff on your hands (phew!) and add the cue word. 1. Only make the click sound if you are going to give the animal a reward. 2. Always reward after a click, even if you clicked by mistake. 3. Only click once - dont get over enthusiastic and dont allow anyone to play with the clicker. 4. Practise your timing (away from your dog) - bounce a ball and try and click as soon as the ball hits the ground. Its not as easy as you think! 5. Keep sessions short and sweet. 5 minutes a session is perfect, especially for a novice.